In red with tan upholstery. This beautiful, two owner 504 Cabriolet, was supplied new to Mr. and Mrs. Garfield-Bennett on Jersey. They kept it until 2014 when a good customer of ours brought it to the UK. It was then treated to a full mechanical overhaul costing nearly £6,000 and given a full repaint to cure fading and light wear from the previous thirty five years. This work is fully documented. The Peugeot is left hand drive and, having been in Jersey, has covered only 29,000 miles since new. The seats were retrimmed and the hood replaced and both remain as new. It has a 2.0 litre, four cylinder engine, a manual gearbox and power steering. We sold the car last winter but the new owner has lost storage space for his collection so, sadly, it is offered for sale once more. 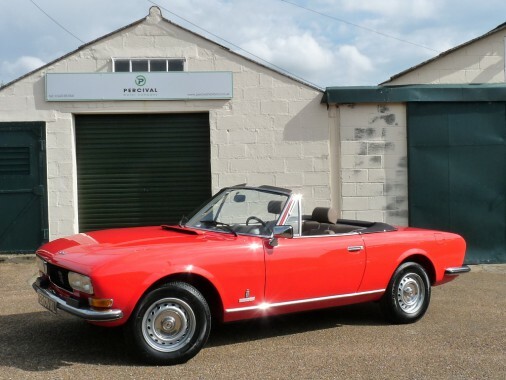 The Cabriolet is in beautiful condition throughout.